. Published on June 22, 2016. You may be a sole trader, but that doesn’t mean you’re alone when it comes to the administrative side of your small business. There’s plenty of software designed to help you attend to the nitty gritty so you can get your hands dirty doing what you do best. We look at some of the best products on offer this year, from accounting to HR, from marketing to cloud-based communications solutions like MightyCall. 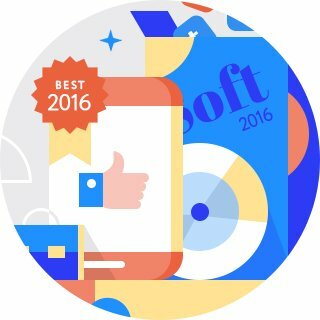 Check out the best small business software of 2016. Although one of the main differences between small and big business when it comes to tech is the budgets, it’s not merely affordability that makes a piece of software just perfect for small businesses. It should also have great scalability, offer options for doing business on-the-go (so a good mobile app is a must,) have responsive customer service and perfectly address your business needs. In this article we’ve included the “must haves” in a small business software kit 2016. Accounting is one of the most time-consuming aspects to running a business which can really give you, not just a headache, but a solid amount of stress. That’s why it’s essential for small business to have a system that has the features that will alleviate the burden as much as possible. Zoho books is double-entry accounting software that is perfectly suitable for really small businesses. Double-entry means that it takes care of your income and expense accounts, or debits and credits. With Zoho books you can create financial reports, reconcile bank and credit accounts with ease, skipping data entry, manage your clients’ data, calculate taxes and more. Zoho books accounting software has three plans ranging from $9-$29. It’s cloud-based, so it works across platforms and devices. Another great thing: Zoho books mobile app is not limited in functionality compared to the desktop version which makes it perfect for doing business on the go. 24/5 support is also a huge plus. Quick books is one of the most recognizable names in the industry and has been named the best accounting software for small businesses by many reputable sources like Business News Daily. It offers more features than Zoho books, which can be quite useful if you are way past the startup stage. It also easily integrates with many third-party apps. One of the advantages is that it is currently used by many accountants, which can be a bonus if you decide to hire an accountant in the future. Although the plans start from $10 you will need to pay $40 a month to unlock all the features. Cons: Mobile app has limited functionality. Managing you company’s human resources is also a challenging task. Thankfully, there are bunch of apps with great free features for you to use. Zenefits is one of them. Solely aimed at small businesses, Zenefits is definitely in for the best small business software title. The program allows you to manage payroll, benefits, 401K and more without paperwork. It integrates all essential HR functions into a single easily manageable platform. What’s more, many of the services come without pay. Extra services include Time & Attendance, FSA, HSA, Commuter. Zenefits payroll feature has not been released yet. But you can join the waitlist now to use it free till December 2016. Although marketing software can be pricy with an average monthly fee is just under $1000, there are still great solutions for small business to promote products or services for a much smaller price. This small business marketing software company positions itself as “all-in-one business platform for entrepreneurs.” One great thing about Ontraport is that it is not just a CRM, but a complex solution providing great online marketing opportunities to small business for a reasonable cost. Features include: CRM, website and landing page builder, email and SMS marketing automation tool, online payment processing and more. If you plan to do business online, it may be well worth the outlay. The Basic $79 monthly plan provides access to email templates, CRM, SMS and marketing automation and landing and web page builder, Facebook lead capture and more. It also has 90days money back guarantee feature for you to see how well it works for your business. If your company delivers services on a project basis, you can greatly benefit from proper project management software that will help you keep all employees up-to-date and make sure deadlines are met. Projecturf is a bit more than just project planning software. Apart from project management, it offers many great resources like built-in collaboration tools, tasks and to-do lists, calendars and events, file sharing and time tracking. The plans are well-balanced, so no matter if you are a freelancer or small business owner you can be sure that you are not buying more features than you actually need. It is quite easy to use, but if you get lost in the many features offered, you can benefit from the great customer support which includes phone support, online support, knowledge base and video tutorials. Communication is essential for business, whether it’s communication within the team or your team with customers. Here any small business will benefit from a complex solution that combines all the communication channels such as e-mail, SMS, phone, voicemail, social media or website. This is a cloud-based virtual phone system designed for small business. It enables small business employees never miss any customer-business interaction by gathering phone, SMS, email and other most popular communication means in a single easy-to-use console. The basic plan costs $19.99 will give you 2 users, 500 talk minutes and 1 toll-free or local business number. Additional numbers can be purchased just for additional $5 a month. It also offers some beneficial features like call recording, click to call website widget, social media connector, etc. which enables you to achieve more than same plans of some market giants like Grasshopper. The main purpose of small business software is to save you time to focus on what’s really important to any small business owner which is to do what you are really passionate about — your business. The software above will help you bring any small business ideas you have to life.